I have left Saxilby due to embarrassment. I had spoken to someone from the Waterways and explained the situation and was told it was ok to stay until the electrics were all fixed and running. The fact that I was moored next to the signboard that said 72 hour moorings somewhat rubbed it in. That and the fact that the two boats ahead of me had paid for their winter moorings make me think of a trip away for a while. Just before I left a rather large boat moored up and I couldn’t help thinking that he would miss the best part of this canal – going through the Glory Hole. He would certainly have to slim down a bit first. Travelled for a couple of hours then moored up near the Pyewipe Inn. A quiet afternoon so a bit of anti-rust work would give me something to do. 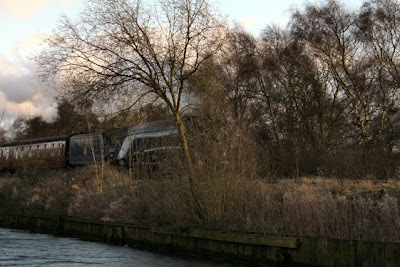 Next thing I knew was the arrival of the steam train ‘Sir Nigel Gresley’ on the railway line next to the canal. A brilliant viewpoint but not the best of pictures I am sad to say. Built for the LNER in 1937, and the 100th Gresley Pacific built. Her Doncaster Works number was 1863. It was originally numbered 4498. It is a 4-6-2 locomotive to the same design by Sir Nigel Gresley as the more famous Mallard. Never a dull moment. I suppose the cat will go for a swim tonight to give interest to the evening.